Where to next in my boots? On a wet winters morning when repeating a local hill walk for the umpteenth time simply doesn’t fill you with enthusiasm, it’s easy to wonder whether after all these years, you’re beginning to exhaust the possibilities. But look a little closer at this small Island we live on and you realise you’ve only really begun to scratch the surface. When entries opened for the TGO Challenge 2016 last autumn I was sorely tempted to apply again. Crossing Scotland on foot during the last two years has been an incredible experience, one I’d love to do again sometime. I couldn’t quite believe it took me so many years to get around to doing the TGOC. But the years seem to fly by so quickly as you get older and I’m becoming precious about my spare time, wondering what else I could be missing. It makes me wonder where else I could have explored if for instance I hadn’t backpacked the Pennine way four times. So out of interest over Christmas I plotted out some of the backpacking I’ve done in the UK, some of the treks I’ve done which were 3 days or longer (not weekend trips, recalling all of those would be a mission too far). And the picture that emerged was quite telling. Even after almost 40 years of backpacking there are great swathes of the UK I simply haven’t even begun to explore on foot. 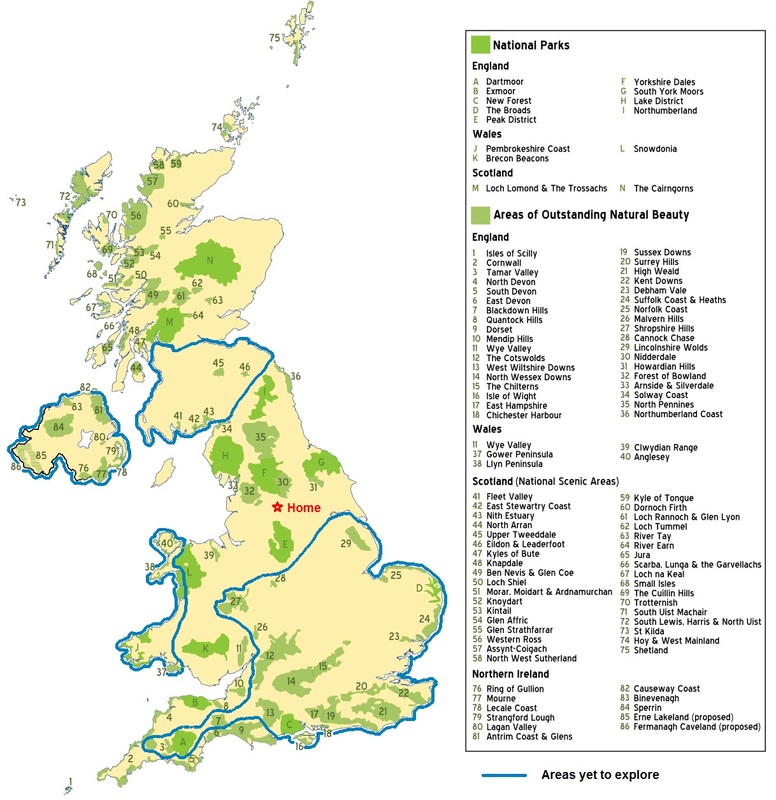 The Southern Uplands, the whole of the South East and East Anglia, the West Coast of Wales, not to mention Northern Ireland. I guess it’s only natural that most of my backpacking has headed either for the high mountains or the areas closest to home, and I’m lucky to live within only an hour or two of no less than five UK National Parks. The concentration of trips up and down the Pennines and around the Lakes and North York Moors says it all. So what am I missing. 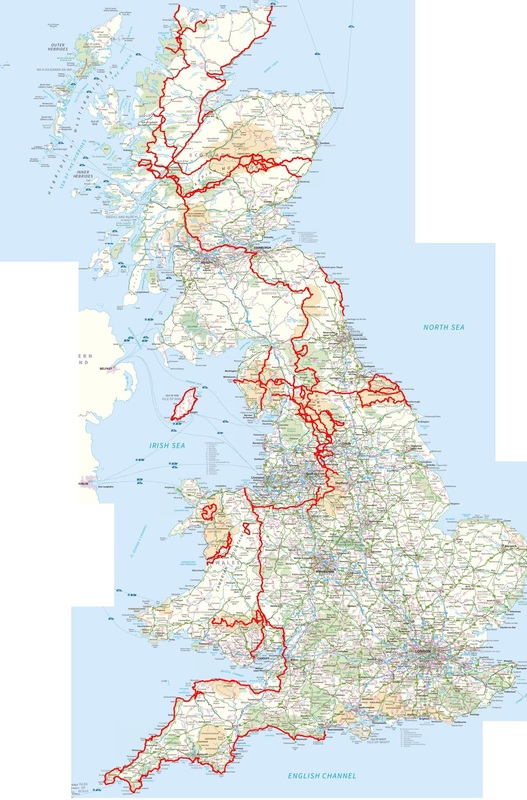 Well take those areas I haven’t explored yet, and overlay them on a map of all the National Parks, Areas of Outstanding Natural Beauty (AONB), and Scottish National Scenic Areas (NSA) and my excitement positively boils over. I myriad of possibilities that could give another 40 years of ideas and planning. When I backpacked from Lands End to John O’Groats over 30 years ago as a spotty teenager, I was thankful back then (as I have been ever since) that I’d taken the opportunity to see so much of my own country. Yet there’s so much still to see. So where to start? The shape and length of each trek will be in proportion to the size and shape of the area (longer treks in the bigger protected areas, linear treks in say the Chilterns, a circular for say the Shropshire Hills). And there we have it, a master plan of ideas that should last me many years into the future. By my own calculations it may take the next ten years to get around all these before I can truly say I’ve seen my own Country. And maybe when all that’s done I’ll let myself do the Pennine Way again for a 5th time, just for old times sake. There is definitely so much to explore on this little island of ours, I think your plan is a really good idea. It can always be tempting to do familiar things again and again, but just what might we be missing? It will take a bit more planning, but that’s where half the fun is. Some fantastic miles done on that map. Like the planning going forward and Pennine Way is a personal favourite. Mind you I only so far have done it once. What about in winter? Now that would be an adventure. Must admit that’s always appealed to me. Big problem for me over winter is having horses which need mucking out etc. Sort of limits winter excursions to a few days currently. One day maybe. You’re right there Robin, I’ve been wanting to head down that way for years. Been a case of so much to do close to home until now. But I’m realising there are areas I’m missing out on. Dartmoor is way up there on my list for this year. Probably a weeks trek taking in as much as possible. Hi Stuart, yes I spent three weeks camping and walking on Skye in my teens and then climbed the Cuillin Ridge back when I used to rock climb a lot in the 90’s. Managed to grab a few weekend s up there too. I’ve not kept records of all the weekend trips over the years so only managed to plot longer walks I’ve done. But I must admit that the Skye Trail does appeal, as does the Timeless Way in the Outer Hebrides. There is some excellent hiking to be had in the Southern Uplands in general and Galloway in particular. When I lived in Hampshire, I backpacked with people who planned routes using the Big Sites Book and the Good Beer Guide. For weekends, this approach gave some surprisingly good hikes. Southern England has little bits of fabulous ecosystems left but, on the whole, I can’t help thinking that the best way to enjoy long journeys in the areas you haven’t touched yet is by bicycle. For example, before a big trip to France, I took my bicycle back to St Johns St Cycles in Bridgwater for a major service and then cycled to Gravesend to meet the European Bike Express. The countryside was glorious all the way and only Kent failed to offer quiet lanes. Would I have enjoyed walking that route? Probably not.